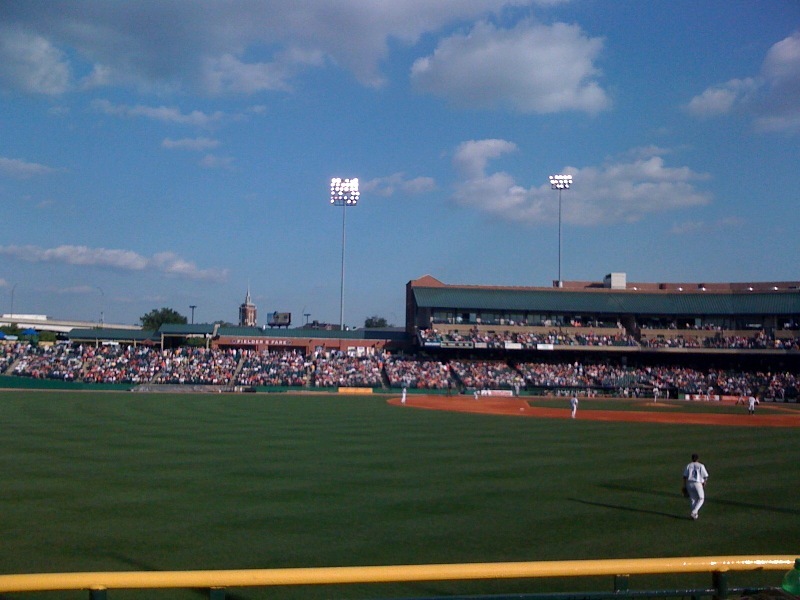 UPDATE (6.7.10): The folks with the Louisville Bats and Slugger Field let me know of some good deals at the ballpark. Visitors are allowed to bring their own bottle of water, which definitely saves a few bucks. And on Tuesdays, hot dogs and small Pepsi products are only $1. Was I the only one unaware of this? It was a bad idea to go to my first minor league baseball game in the midst of my years-long Chubby Stage. As a plump little girl with no athletic ability, I didn’t care about the sport. I just wanted the food. I was 10. My friend Sara’s grandmother took the pair of us to watch the Louisville Bats play. The sky was gray, the seats were hard, but the food was amazing. Vanilla ice cream that twirled up from the edges of a crunchy waffle cone. Hot dogs topped with a swirl of yellow mustard. Sweaty paper cups filled with ice cubes and Coke. A decade later, not much has changed. I’m not as round as I once was (thank you, Weight Watchers), but I still go to minor league games primarily for the food. On a recent trip to Louisville Slugger Field, I discovered that ballpark food is still as wonderful as I remember. I picked up a great bargain on Groupon that made it financially feasible to go to a Louisville Bats game — four tickets (normally a $28 purchase) for only 15 bucks. A beautiful day for a baseball game. The deals ended at the entrance gate. I reviewed concession stand prices online before the game. It turns out that the stadium has major-league prices for basic ballpark fare. $3.25 for peanuts? $4 for nachos? $4.50 for my beloved waffle cone? It was just too much. I was doubtful that I would be able to limit myself to only spending $10. The evening game encroached on dinner time. I wanted a suitable meal at the game, not just an assortment of sweet, empty calories. My two friends and I decided to do a lap around the stadium (a more tiring task than anticipated) to weigh our options before settling on something to eat. What Slugger Field lacks in thriftiness, it attempts to make up for in variety. There’s the standards, many of which are fried or just plain fatty — chili cheese fries ($5), bologna sandwich ($3.25) and bratwurst ($3.75) among them. But the ballpark attempts to extend the palate of hungry fans. Health-conscious eaters had options like a baked sweet potato ($3.75), veggie burger ($4.50) or basil pesto chicken panini ($6.50). I had a craving for something filling and fatty (hey, you have to treat yourself occasionally). I considered the pork chop sandwich ($6.25), a thick slab of meat that is promoted on billboards throughout the city. But in an attempt to lay off the pork, I got in line to order the chicken fingers with fries ($6.25). Twenty minutes in a line for food messed with my mind. As I watched the lucky ones pass me with their steaming baskets of fries, burgers and chicken rings, I began to question what I really wanted. Everything looks good when I’m hungry and waiting. By the time I made it to the front of the line, I switched my order to a corn dog ($2.50), onion rings ($4.25) and bottle of water ($3) based solely on the plate of the guy in front of me. 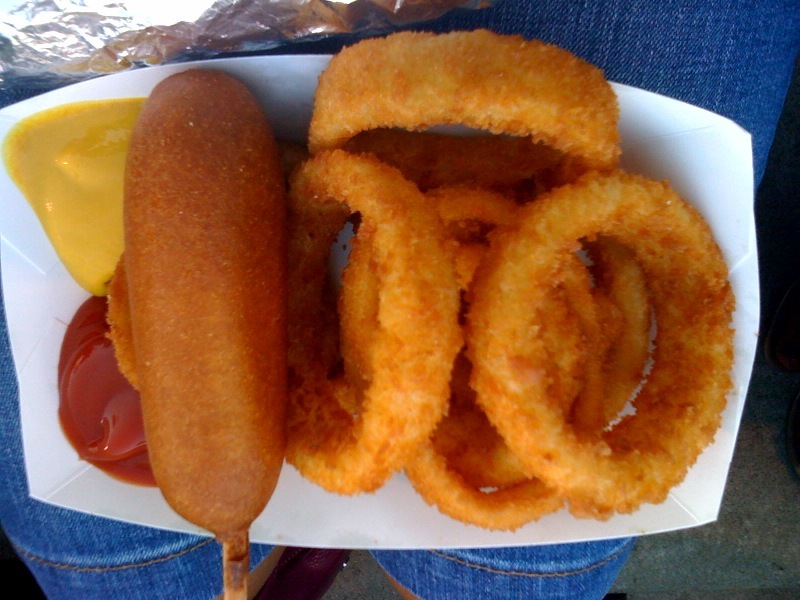 Corn dogs and onion rings. Look at all that cholesterol. The basket of brown, fried food was everything I expected it to be. The cornbread was cooked thoroughly down to the meat, a trait I’ve learned to appreciate. I’ve had a couple of corn dogs that were cooked too quickly, which resulted in a crispy exterior but soggy batter around the hot dog. A few dips in some mustard was all my corn dog needed. The onion rings were massive. Each ring was big enough to make a bangle bracelet (not that I tried or anything). The batter crunched with each bite, and the onion didn’t slide out of the batter ring, a fried-food pet peeve of mine. The onion tasted fairly fresh, but I would have preferred more onion in terms of the onion-to-batter ratio. I was pleasantly surprised that I came in under my $10 limit. The meal was tasty and filling. But spending only 10 bucks at Slugger Field requires some studying of the menu, self-made combo platters and sacrifices: there was no money left for ice cream, which would have made my Louisville Bats experience come full circle. Louisville Slugger Field, 401 East Main Street, Louisville, Ky.
Just found your blog off Consuming Louisville. I love the $10 Challenges! I’m also a not-exactly-rich journalist so it’s nice to read about something other than people going out for $50 dinners or whatever. Can’t wait to read more!